FC Cincinnati broke ground on its stadium two months ago. It finished buying the land today. Wait, didn't they do that already? General manager Jeff Berding thought they had. CINCINNATI — FC Cincinnati’s race to construct a Major League Soccer-approved stadium in the West End occasionally looks like more hurdle than track. 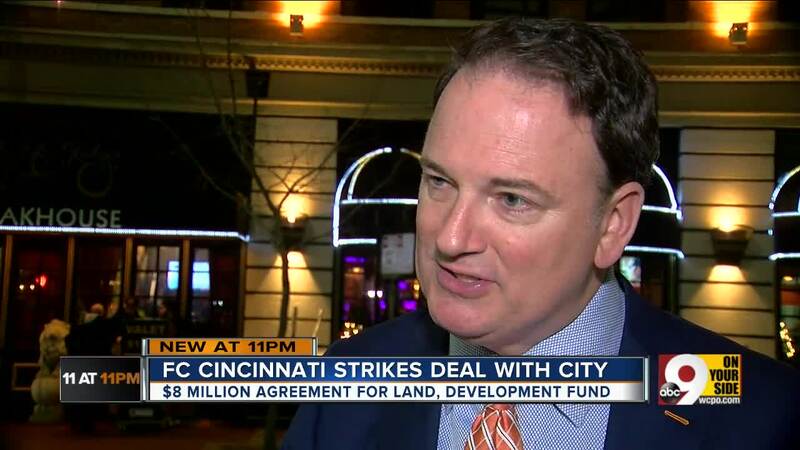 Two days after a noise study funded by the Cincinnati Arts Association found the stadium would likely disrupt performances at nearby Music Hall, general manager Jeff Berding hit two new stumbling blocks in a meeting of City Council. First and quickly resolved: The revelation that the team had begun building its stadium without actually acquiring all the land it would need to do so. Much of that money will be funneled into a community development fund, Berding added. The team’s promise to better the West End neighborhood, where the 2010 census recorded a median household income of $12,808, was a linchpin of the community’s ultimate agreement to host them. Second and stickier: The question of closing Central Parkway on game days. The team claims the closure would be necessary to protect the safety of pedestrians walking to and from the stadium; members of council claim it would overcomplicate traffic. Seelbach remained passionate Wednesday night, claiming West Enders had clearly communicated they did not want the FC Cincinnati stadium and that imposing additional burdens would disrupt their lives even more. “That’s another slap to these residents who are going to have major obstructions to getting to work, home and around,” he said. “I want to make sure we’re not going to completely forget the West End residents who got the raw end of the deal, and perhaps a bigger raw end of the deal." The stadium deal did face significant opposition from many who worried it would drive residents out of their neighborhood, but a community council reached a community benefits agreement with FC Cincinnati May 16, 2018. Berding cited its support after the meeting. Council did not vote on the closure issue Wednesday, and the motion its members signed does not have the power of law behind it. Seelbach said discussions with public safety officials and people living in the West End would help determine the council’s next step.